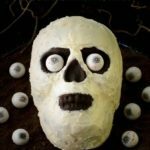 This Chocolate Potato Skull Cake with Vanilla Buttercream Frosting will be a hit your Halloween or Day of the Dead party. It's fun and delicious too. Peel and dice the potato and place in a saucepan. Cover with 1-inch of water. Do not add salt to the water. Bring to a boil and simmer until tender. Drain water. Mash potato until smooth (no lumps!). Allow to cool to room temperature. Preheat oven to 350 degrees F. Lightly grease a skull cake pan or 2 9-inch round cake pans. Dust pan(s) with cocoa powder. Whisk together flour, cocoa powder, and baking soda in a medium bowl. Beat butter and sugar in a large bowl until light and fluffy. Add eggs and vanilla, beating well after each addition. Add 1 cup mashed potato and mix to combine. (Reserve any remaining potato for another use if desired). Add flour mixture, alternately with buttermilk, beginning and ending with flour mixture. Mix until just combined after each addition (do not over-mix). Transfer batter to prepared pan(s), dividing equally and spreading evenly in the pan(s). Bake until a toothpick or cake tester inserted in the center comes out clean. It could be anywhere from 30 to 60 minutes depending on the pan used (skull cake pan takes longer). Check every few minutes after 30 minutes of baking time. Cool cake in the pan(s) for 10 minutes then remove cake from pan(s) and cool completely on a wire rack. Beat butter until creamy. Add vanilla and salt and beat to combine. Add confectioners sugar and beat with enough half-and-half to reach desired spreading consistency. Spread frosting between cake layers and on sides and top of cake. If using skull cake pan, do not spread frosting in the eye or nose indentions or over teeth area. Put a very small dollop of frosting in the center of each eye indention. Press gumball on each dollop of frosting. Spread crushed graham crackers on the serving plate around the skull cake. Place more gumballs around the cake. This Chocolate Potato Skull Cake with Vanilla Buttercream Frosting will be a hit at your Halloween or Day of the Dead celebrations.